Ajit Narayanan is the the Founder and CEO of Invention Labs, and inventor of Avaz AAC, an affordable, tablet-based communication device for people who are speech-impaired. Avaz AAC is the first assistive device aimed at the India market that allows people with speech disabilities — such as cerebral palsy, autism, intellectual disability, aphasia and learning disabilities — to communicate. Avaz is also available as an iPad app, aimed at children with autism. In 2010, Avaz won the National Award for Empowerment of People with Disabilities from the President of India, and in 2011, Narayanan won Innovator of the Year from MIT Technology Review for the creation of Avaz. In 2013, Ajit gave a TED talk, at the TED Conference in Long Beach California, about his research. Narayanan is a prolific inventor with more than 20 patent applications. 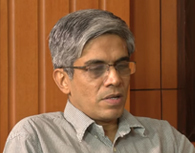 He is an electrical engineer, with degrees from IIT Madras; his research interests are in embedded systems, signal processing, and understanding how the brain perceives language and communication.